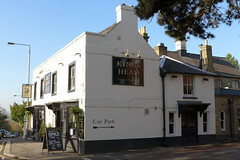 It was previously part of the Ember Inns chain (Mitchells and Butlers), but according to the April/May 2011 edition of London Drinker it was acquired by the Stonegate Pub Company in October 2010. However, a year later the characteristic feel of the Ember Inn was still present, with large tables and nicely upholstered tall-backed chairs spaced widely around the pub, and large pottery vases and things displayed here and there. The ceiling is low, and the space broken up by pillars. Kake visited on a Tuesday early evening in September 2011. There were several people in when I arrived a little after 6pm, spread around the pub, but a wide choice of free seating. Music was playing quietly. Five of the six handpumps were on, offering Spitfire, something from Hobgoblin with a glowing pump clip, Landlord (£1.70/half), London Pride, and Doom Bar. Quiz nights are Wednesdays and Sundays from 9pm, according to the 2010 Good Beer Guide. Accessibility: A small step to get in (kerb height or less). Once you're in, it's step-free to the bar, most if not all of the seating, and the accessible toilet. Other toilets are up a wide flight of stairs with sturdy handrails on both sides all the way up, then a big landing, then two more steps with no handholds. Last visited by Kake, September 2011. Food times taken from menu on that visit. Opening times taken from the 2010 Good Beer Guide. Last edited 2016-09-18 15:42:39 (version 13; diff). List all versions. Page last edited 2016-09-18 15:42:39 (version 13).